Fellow podcast host, Simon Head, has had an interesting life. 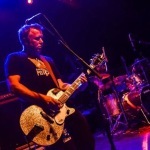 His fascination with sound engineering and musicianship led him to years on the road with his own bands, almost dying in a van crash, and eventually to touring with international punk band, SUM 41. Armed with the DIY attitude, Simon crisscrossed the country with his traveling recording studio creating music all along the way. We also discuss our shared heartbreak with having a brother that committed suicide and the fall out from that, as well as his deep love and gratitude for his wife and children.